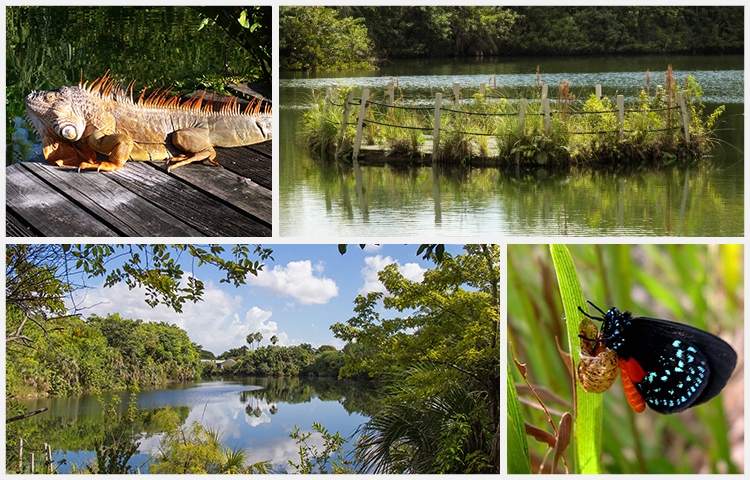 The Environmental Center at Miami Dade College, Kendall Campus, offers a variety of classes, field trips, and workshops for children and adults in our 9-acre, native nature preserve. The Center features a pristine lake, an endangered pine rockland, hammocks, butterfly gardens, native plantings, an organic garden, and a variety of animals. Come join us every second Saturday for Nature Days at the Environmental Center. Each month has a different theme, hosted by one of our resident naturalists, with activities, demonstrations, and talks. This is a perfect way to spend some time outdoors with your family! This new state-of-the-art facility is completely "off the grid" utilizing solar panels, a composting toilet, rain water collection and other features that make it a showcase for over 10,000 visitors each year. Guests now have a wonderful meeting place where they can learn about the technology and techniques that reduce our carbon footprint and help to preserve the environment for future generations. Did you know that our visitor pavilion is designed to LEED Platinum standards, making it one of very few school buildings in Florida to achieve this standard?